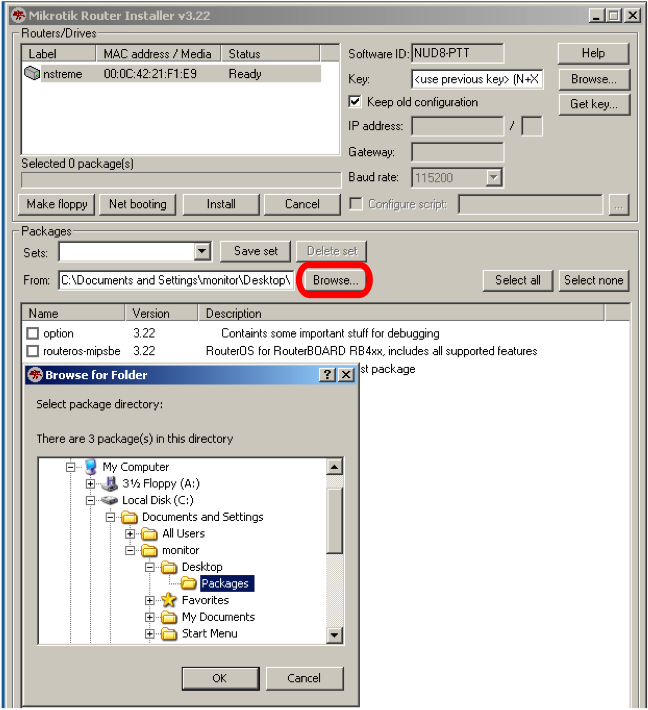 NetInstall is a program that runs on Windows computer that allows you to install MikroTiK RouterOS onto a PC or onto a RouterBoard via an Ethernet network. You can download Netinstall on our download page. NetInstall is also used to re-install RouterOS in cases where the the previous install failed, became damaged or access passwords were lost. Your device must support booting from ethernet, and there must be a direct ethernet link from the Netinstall computer to the target device. 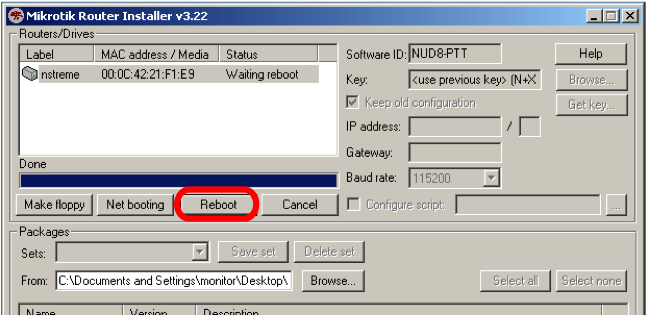 All RouterBOARDs support PXE network booting, it must be either enabled inside RouterOS "routerboard" menu if RouterOS is operable, or in the bootloader settings. For this you will need a serial cable. Netinstall can also directly install RouterOS on a disk (USB/CF/IDE/SATA) that is connected to the Netinstall Windows machine. After installation just move the disk to the Router machine and boot from it. for installation over network, don't forget to enable the PXE server, and make sure Netinstall is not blocked by your firewall or antivirus. The connection should be directly from your Windows PC to the Router PC (or RouterBOARD), or at least through a switch/hub. This is a step by step example of how to install RouterOS on a RouterBoard 532 from a typical notebook computer. The .npk RouterOS file(s) (not .zip file) of the RouterOS version that you wish to install onto the Routerboard. Run the NetInstall program on your notebook computer. Set the RouterBoard BIOS to boot from the Ethernet interface. RouterBOARD 751U-2HnD RouterBOOT reset button (RES, front panel) has two functions to reset RouterOS configuration and boot it from Etherboot: - Connect Netinstall PC to "ether1" port and hold this button during boot time longer, until LED turns off, then release it to make the RouterBOARD look for Netinstall servers. 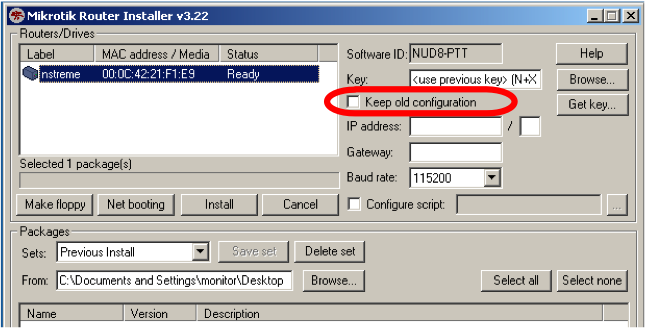 To access Routerboard BIOS configuration: reboot the Routerboard while observing the activity on the Serial Console. 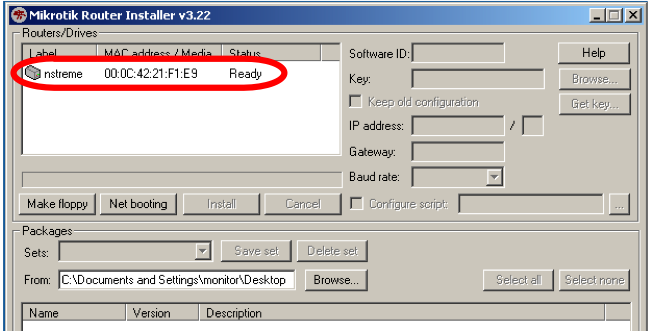 You will see the following prompt on the Serial Console “Press any key within 2 seconds to enter setup” indicating that you have a 1 or 2 second window of time when pressing any key will give you access to Routerboard BIOS configuration options. The RouterBoard BIOS will return to the first menu. Press the 'x' key to exit from BIOS. The router will reboot. Make sure boot-protocol is bootp. Watch the serial console as the RouterBoard reboots, it will indicate that the RouterBoard is attempting to boot to the NetInstall program. 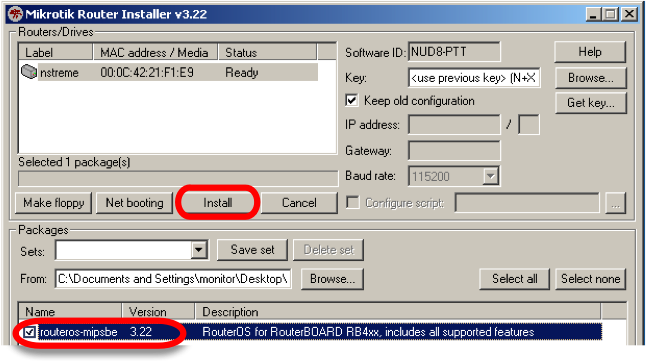 The NetInstall program will give the RouterBoard the IP address you entered at Step 4 (above), and the RouterBoard will be ready for software installation. Now you should see the MAC Address of the RouterBoard appear in the Routers/Drives list of the NetInstall program. Click on the desired Router/Drive entry and you will be able to configure various installation parameters associated with that Router/Drive entry. Press the "Browse" button on the NetInstall program screen. Browse to the folder containing the .npk RouterOS file(s) of the RouterOS version that you wish to install onto the Routerboard. When you have finalized the installation parameters, press the "Install" button to install RouterOS. When the installation process has finished, press 'Enter' on the console or 'Reboot' button in the NetInstall program. 1. Reset the BIOS Configuration of the RouterBoard to boot from its own memory.